Last night I attended the 15th Annual Honors Night at the Pueblo of Laguna Tribal Auditorium. The event was put together by the Laguna Education Foundation and Partners For Success to recognize the efforts and achievements of the students from Laguna Pueblo. I was able to see and meet many of the pueblo youth who have made the significant effort to complete their GED, Bachelor, and Masters degrees (over 20 of them). It was also great to see the many Laguna High School students receive the LEF scholarships to allow them to attend a college of their choice. I myself benefited from this same higher education program when I attended SMU. I also had the honor of talking to the students, tribal council, and community members to share some of my thoughts on education today. I wanted to share my perspective on the changes in learning due to high speed internet connectivity and personal learning styles, people now have more options to gain knowledge. I personally use time-shifted education (web videos, web meetings, podcasts, & screencasts) to keep my skills up-to-date and maintain competitiveness. We also enjoyed a wonderful red chile stew, turkey, & beef dinner from Grandma Joe’s Catering. In particular, I loved the pumpkin pie. Here is the presentation titled “Adaptive Learning” that I’ve uploaded to slideshare. I will add the audio when I get some time to process the recorded content from the evening. Enjoy! I recently changed out my fly line & backing on one of my reels. I usually use a nail knot to connect the backing to the fly line and another nail knot to connect the fly line to a monofilament leader loop. It’s been quite a while since tying a nail knot, and I have a tool to help with it called the Tie-Fast, but I lost the instructions or directions. So, I searched around to see if there were any PDF instructions on the manufacturer’s website. In the searching I found something much more informative. On youtube, I found WildOnTheFly’s video on how to use the Tie Fast tool. It’s a great little instructional video on how to tie several knots using the tool like: nail knot, nail knot splice (blood knot), nail knot on a fly, and a snell knot (or shank tie). If you fish and happen to have the Tie-Fast tool (or something like it), this video is worth watching. Enjoy & thanks to WildOnTheFly! 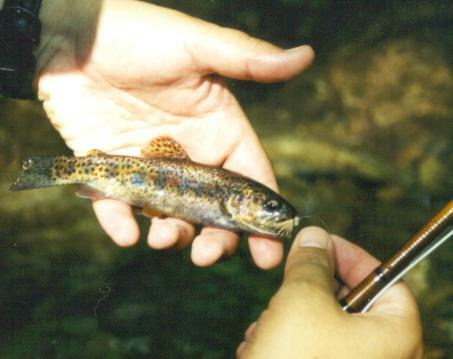 I came across some pictures from when I trout fished in North Carolina back in the late 90’s, some great memories. 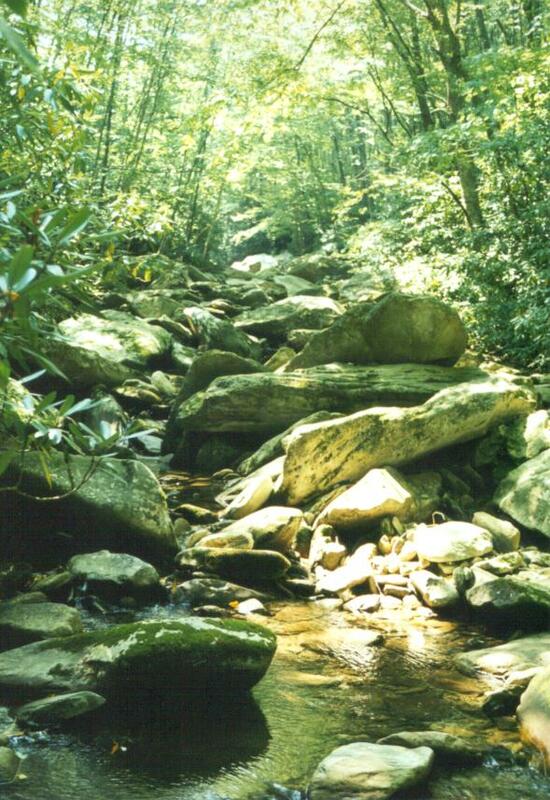 I really liked fishing the Upper Boone Fork, this little gin-clear stream offered boulder hopping and wild trout under a nice canopy of trees. I casted flies into small pools often at eye level since the elevation change was so steep. The Upper Boone Fork drains into Price Lake just off the Blue Ridge Parkway. There are wild trout in this little stream. As you can see (from the fly size), the little fish smack just about anything if you don’t spook them first. The fly is a size 18 Elk Hair Caddis. Here is a link to the nearby parking area so you can find this nice little & challenging creek (if it’s still like this). Enjoy! For every 10 miles an hour in speed you are driving on the highway, you should be that many seconds behind the car in front of you. 10 miles per hour = 1 second. Always stop so you can see the rear tires of the car in front of you. It gives you a chance to move in the event of a stalled car and keeps you from hitting someone if rear ended. A right turn is always safer than a left turn. Always try and drive ahead of yourself, if you see traffic slowing down ahead, slow down too. Always try and know what/who is around you, check the mirrors often, you never know when you have to swerve and it would be good to know the space beside you is not occupied. 18 wheelers can’t see very well, be prepared for them to pull in front of you (cut you off) on the highway (this happened just when my dad was telling me). Large vehicles & trucks are heavy, you don’t want to be in front of them if they have to slow down or stop quick. Keep both hands on the wheel, it puts you in better control if a tire fails. Try not to drive when you are tired, accidents happen when you are not mentally alert. Rest if you need to. They are not motorcycles, they’re called donorcycles (he meant organ donor). In a wreck, a vehicle is physically around you to help protect you. Make sure the people who ride with you wear their seat belts. 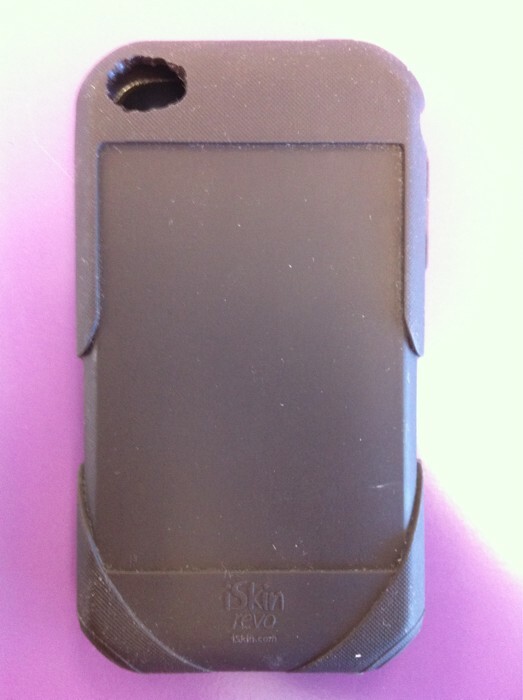 Ok, I’m waiting for a email from iSkin.com on when their new iPhone 4 silicone cases will be available, no email yet, it’s been a week since adding my name, and 2 weeks since the phone has been out. You can also see my iPhone 4 review here. In the meantime, I took my iSkin revo case which I had for my original iPhone and modified it somewhat so I can use the 2 cameras on my new iPhone 4. 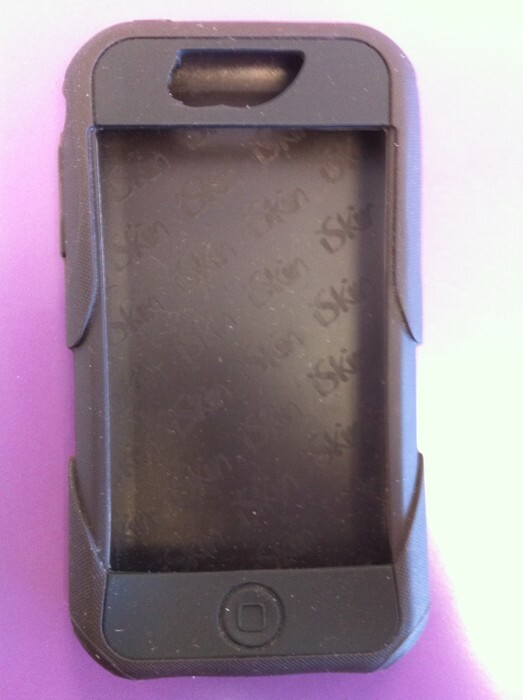 The older cases are still being sold on the iSkin website for $20. Here is what the new modified case looks like, I removed material on the left side of the earpiece opening so the front camera is not covered & increased the camera hole size in the back to show the full lens and the led light. The tools used, a paper hole puncher and small wire cutters. These photos were taken using the iPhone 4 & uploaded to twitpic while waiting for a to-go order at the local Lotaburger (they have purple tables). 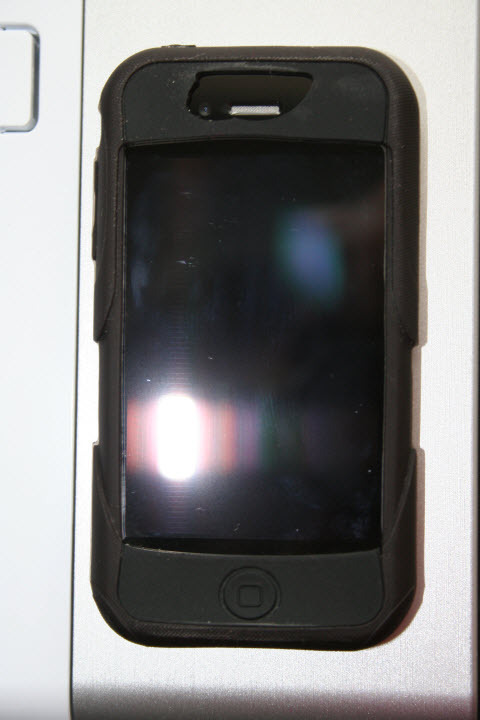 Additional photos below of the iPhone in the modified revo case below. 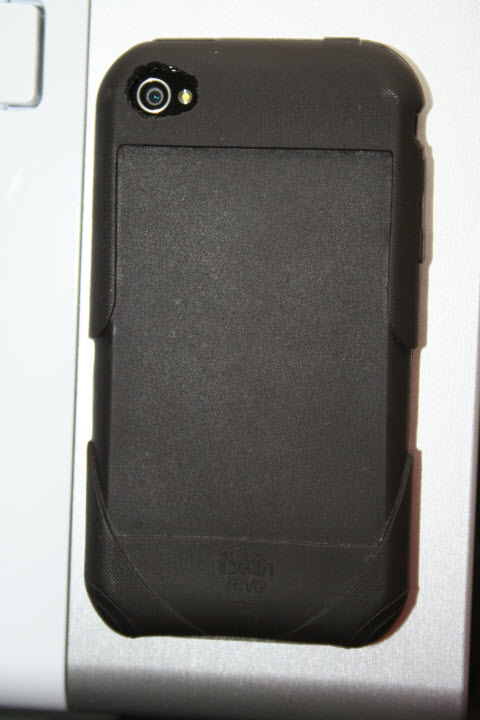 Now I can take pics and shoot video with the iPhone protected by a case. I was teaching in San Ramon, CA when my new iPhone 4 arrived at the house last week. 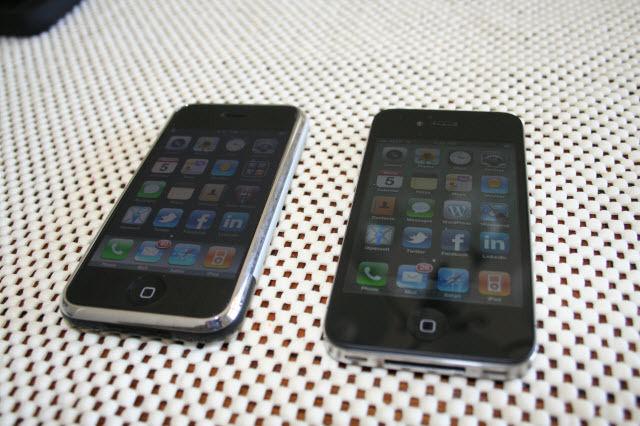 My wife and I have had some of the original iPhones for several years and liked them (we also protected our phones using the iSkin revo). We decided to continue with the new iPhones due to being grandfathered into the unlimited data plan, and I can use the phone when I travel internationally (because it uses a GSM radio versus CDMA). I activated our phones after getting back on Friday (7/2) and started using our iPhone 4s. I can say these phones are beautiful and no picture I can take will do any justice to the ones on the Apple website here. My brother Pat, who is an expert working with stainless steel was impressed with the new industrial design. 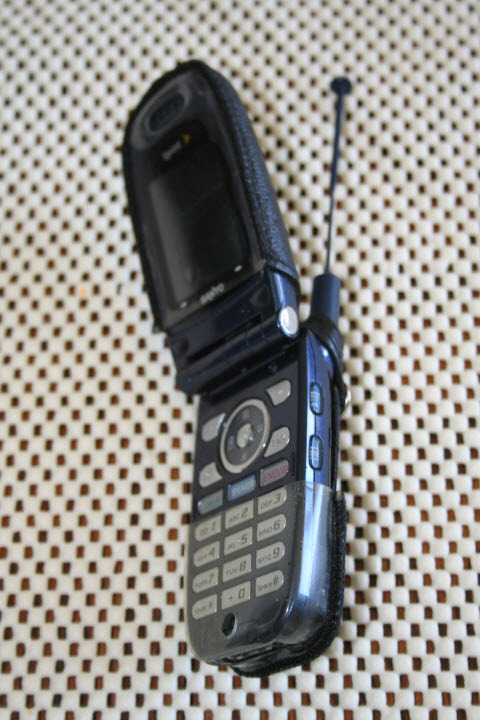 Of course, the new iPhones are quicker, many of the tasks I performed on the older iPhone are so much faster now. But then again, when you let almost 3 years pass before updating hardware, it will be faster since hardware technology changes so fast today. Here is some test video from the iPhone, the video was shot, trimmed, and uploaded all from the phone. Even though the iPhone records in 720p HD, the process (without iMovie) compresses the video BEFORE uploading to youtube, hence there is no HD on the sample video here. I guess that can be expected when uploading using the 3G connection, AT&T does not want all kinds of HD video clogging up it’s already stressed network. Will try iMovie for the iPhone sometime soon and see what happens. Here is the same video, I used iPhoto on the Mac to “copy” off the .MOV file then uploaded this version to youtube. As you can see this video has the HD option and is a bit clearer when you switch to the 720p setting. The raw .MOV file details are: 1280×720 res, 24fps, AAC mono 44.1kHz, 10.4 mbits/sec. BTW, the iPhone was held in the tripod using the ProPrompter Wing hardware. Overall, the HD video will be nice for on the fly video recording, replacing the Flip HD we have. 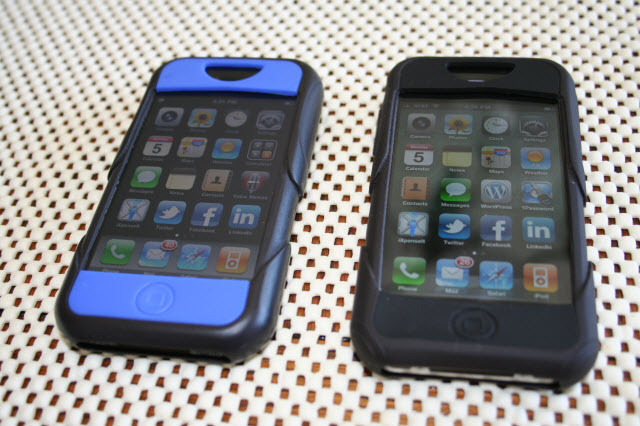 Moving up to GPS is a plus, and it looks like we are going to enjoy our new iPhones once we have cases that fit well.